With my day job (tutoring business) keeping me busier than expected, I find that I don’t get to sculpt as much as I should. That’s just part of it. Another part is fear and lack of self confidence. 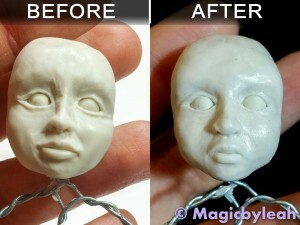 I realize that it takes years of practice and many sculpted dolls before improvement is seen. But I still feel frustrated when my 3-dimensional figures don’t fully match my expectation. I know that I need practice, but I really need guided practice. 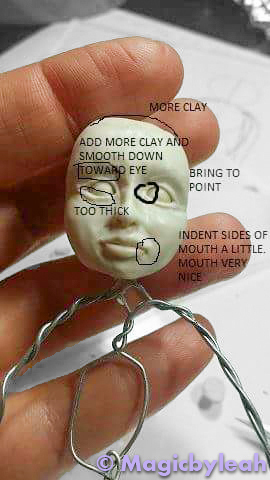 I sought out a sculpting class but that didn’t go too well. 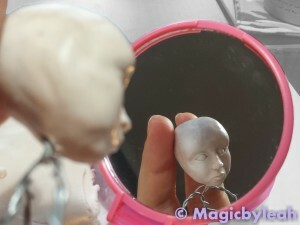 Read about it here: My first sculpting class experience. I felt the instructor was doing rather than teaching. Obviously this didn’t help me learn. What I REALLY need is a teacher to say ‘this part needs to be like this, and that part needs to be like that’. Someone to explain what I’m doing wrong, WHY IT’S WRONG, and how to fix it. 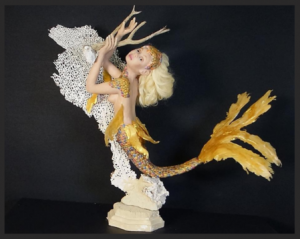 There is a guild for polymer clay sculptors called the Professional Doll Makers Art Guild. The skill to get in is far beyond what I have so far. But I’ve been following their work and been a part of their Facebook Group for a while now. Last year I learned of their Apprentice Program. Through this program, apprentice (beginner) sculptors like myself are assigned a personal mentor. This relationship is almost like tutoring, where the mentor helps guide and critique works in progress to help the amateur improve. I am delighted to be working with none other than Cherie Fretto, a talented artist and leader within the guild. Below is some of Cherie’s work shared with permission. Click here to see even more of her stunning work. Cherie is a wonderful person and very talented sculptor. She understands my desire for perfection and pushes me to improve improve improve. In fact, I’ve had to ask her to allow my first sculpture (the one below) to be less ‘perfect’ for the sake of finishing it in the next… year? Sad to say it’s been taking me months with life constantly getting in the way. But I’m happy and proud of the progress we’ve made together. 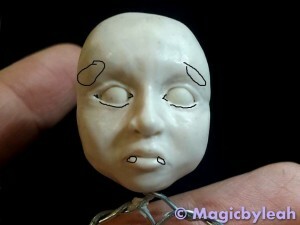 Our first project together was a ‘test face’ for me to improve some of the basics. I was scared to start a full doll but Cherie pushed me. I’ll be sharing progress photos and lessons learned along the way. The mentoring process is simple and straight forward. I started with no particular technique in mind. 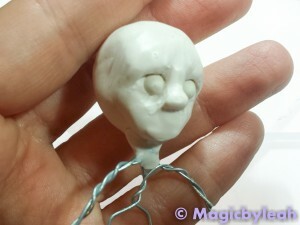 Build armature and build up the facial features. Soon as the face started resembling a human being I barraged Cherie with a series of photos taken on my phone. Here are some of her critique photos. She uses my very own images to mark up and offer suggestions. Every photo comes back with a few simple critiques. Once the improvements were made I’d share the revisions and get more ‘homework’ for improvements. WOW! 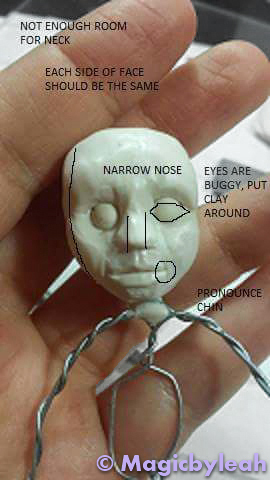 I never realized how much time and work goes into sculpting a proper doll. And even when I thought “Wow this is the most realistic face I’ve sculpted…” I got a list of even more improvements! The final product of this back and forth, while not quite perfection, is still the most realistic face I have sculpted to date. And this is just the first one. 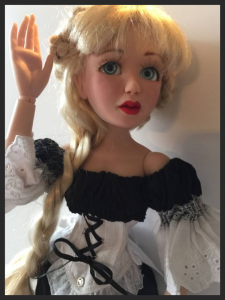 To be honest, I’m scared to move on with the rest of this doll. While faces are very difficult, I’ve had the most practice with them. The rest of the doll is quite unfamiliar territory for me. I have little experience with hands and even less experience with toes. 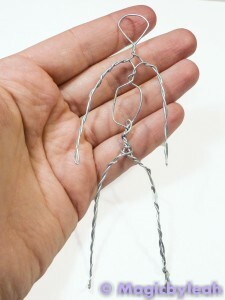 My goal is to sculpt the body for practice, then cover it up with clothes to hide my imperfections. The only way to get better is practice right? Let’s see if I can finish this doll before the new year! Wow you have done really well! Like you ive started to sculpt as a beginner, my first hobby was cake decorating and i found the modelling more appealling than the cakes but life as it does got in the way and health caused me to relook at modelling from a different angle…its the fear factor that holds me back like you and after purchasing numerous tutorials with a super Artist i find im not spending as much time as i should practicing..i find im putting too much pressure on my self as a beginner..our Artists have years of experience behind them, perfecting their technics and creating their own special unique ooak dolls..you and i will hopefully get there with time and practice, your already on your way and ive no doubt yiur dolls will be perfect with time and love! i look forward to your up dates..good luck and happy sculpting. Thank you Marth. I’m not familiar with Kate Church. Do you have a link to her website?